My friends in the band Swingset Showdown recently funded their debut album “Short Bus Ruckus” with Kickstarter, and hooked up with me to do the album art. These are the cats who made my theme song, so how could I refuse? Swingset Showdown’s stuff is boisterous, tongue-in-cheek music that has more intricacy than it should, considering its juvenile nature. I wanted to capture that, so a major inspiration came from Jack Davis. His album covers had an overstimulating, to0-much-going-on quality to them that made their entertainment value last beyond the first glance. Another concept I love for this sorta thing is doing flat compositions, where you’re almost looking at the scene like it’s a trompe l’oeil. Rockwell did this a bunch. The nice thing is that, since you commit to a flat perspective, you can focus on the silhouette and flow of a picture rather than whether your perspective math is correct. After several such roadside scenes were used to make the album art, I turned them into a long landscape, and used that to make a polar panorama. I had a lot of fun working with them, and the album turned out great. Come see them get down at their CD release party on Saturday, Dec. 15th at the High Dive! P.S. No Seabug in January, as I’ll be on baby hiatus. P.P.S Jack Davis & Norman Rockwell copyright blah blah blah. Guess what came in the mail the other day! 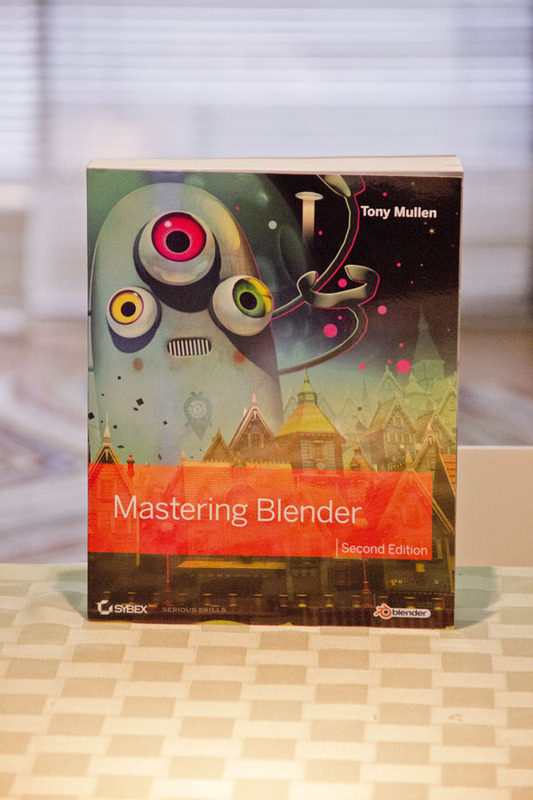 An advanced copy of Mastering Blender 2nd Edition, by Tony Mullen. I was tech editor for this book, which involved a hefty update to Blender 2.6x’s updated interface, shortcuts and features. Mastering Blender is a great kitchen sink book on Blender, covering everything beyond the beginning interface and controls. Modeling, particles, game engine, python, rendering, compositing, you name it. It’s a wonderful stocking stuffer for the blender nut in your life. Buy it from Amazon! And while you’re at it, check out Tony Mullen’s production blog for his short film Electric Town. Chances are, at some point you’ll be faced with the task of taking photos for an environment map. Doing it yourself means creating an EXR or HDR file, which has high dynamic range, and thus the lighting will accurately affect your scene. In Cycles, you can fake such a photo into having more lighting information than it actually does by combining it with a Sky texture. Here’s the node setup. Sky textures assume a whole world’s lighting, so I use gamma to clamp out the higher levels, then make it a little more yellow with a mix node. On its own, the JPEG sky can’t go up or down in exposure like an HDR file; it’ll just blast it out with pixels or dull the lights. Lastly, the mapping node in the start lets you “spin” the world with the Z rotation.